You can listen directly to the podcast version of this podcast here. Today's topic addresses common-cause in the above model. Learn more about the model and how you can use it in your own best way here. It’s my firm belief that without a common cause, common sense often eludes us in the workplace as much as anywhere else. In the late 1990’s, a time some writers have noted as the beginning of another renaissance, I observed that values and value based businesses were on the rise. I saw this accelerate over the next decade. I wrote about this in a 6th February 2012 blog post. More and more we are buying products and services we perceive to be of high value that are provided by people who live values that align with ours. In short from people we trust. Of course trust has been heavily eroded. Number 6 in Mark McCrindle’s top 6 trends for 2019 is the power of trust. A consequence of client work and conversations with clients was the realisation that people need to feel genuinely valued before they will consistently live values and deliver remarkable value. Of course trusting people and being trustworthy are integral to this. 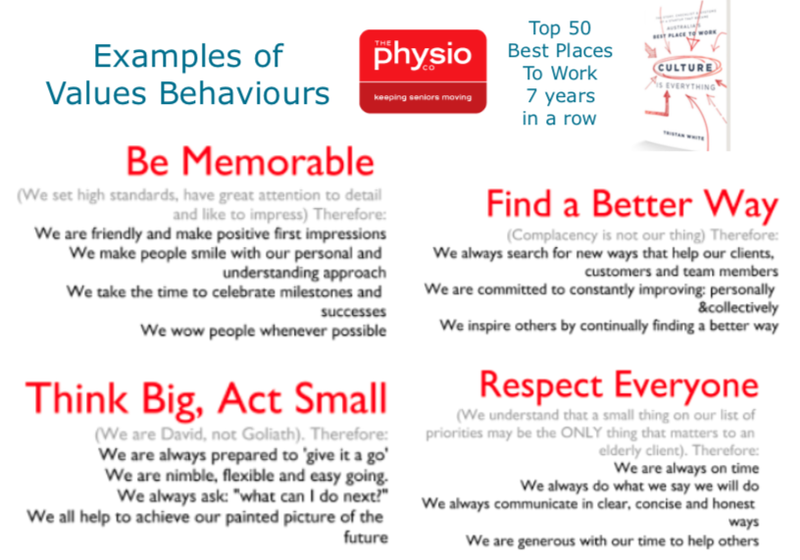 people feeling valued, living values and delivering value. Imagine a 3 legged stool or as I picture them as a triangle. 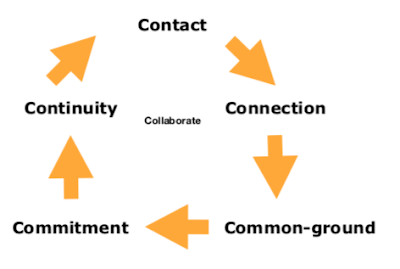 It had become obvious to me that having the common-cause to increase the number of people feeling valued, living values and delivering value was the simplest yet most profound process to achieve what everyone deep down really wants - better business results at less human and business cost. By 2014 my feelings and thoughts evolved to a working model. By the time the second book in my remarkability trilogy ‘The Appreciative Leader’ was published in 2016 the model had grown further and had been through tried, tested and proven. Through further work with clients it became obvious to me that leadership needs allies to thrive. In part this is because leadership has been degenerated by political, religious and business people over generations. Real leadership is important yet more is needed. I’ve thought long and hard about this and took a detailed look back at the wonderful people I have been privileged to work with searching for commonalities. I concluded that the most inspiring and influential people making the greatest positive difference were all in their own best way living seven relationship roles remarkably. As a collective I named this being a Sparkenator from the verb I created in Changing What’s Normal, the first book in the remarkability trilogy. 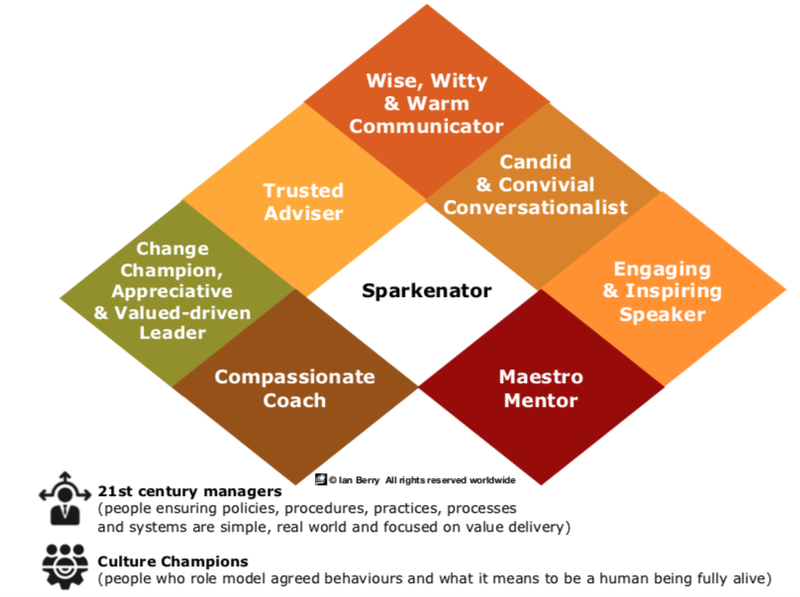 Sparkenation (a spark that ignites passion that leads to action that changes what’s normal). I also upgraded the other roles in the model: 21st century managers (people ensuring policies, procedures, practices, processes and systems are simple, real world and focused on value delivery), and culture champions (people who role model agreed behaviours and the who before do concept as well as what it means to be a human being fully alive. Hence a further evolved model as pictured that I now use widely. 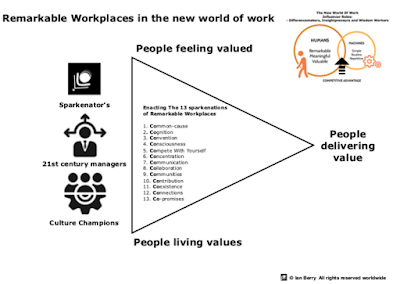 In the Remarkable workplaces book, the final in the remarkability trilogy, I recommend 3 actions and also some deep work. 1) Decide once and for all that no matter what, people and the planet are always before profit in your workplace. 2) Discuss with your team how well you’re going in ensuring people feel valued. Below is a short list of actions you must be doing. What would you add to the list? Catching people doing things right and doing the right thing. Informally and formally celebrating with people what is going well for them. Always saying please and thank you and meaning it. Sharing stories about the successes of your people. 3) Systematically begin to review all your processes (includes policies, procedures, practices, and systems) and upgrade wherever appropriate to ensure that they mean it’s simple for people to be the best version of themselves and deliver value. 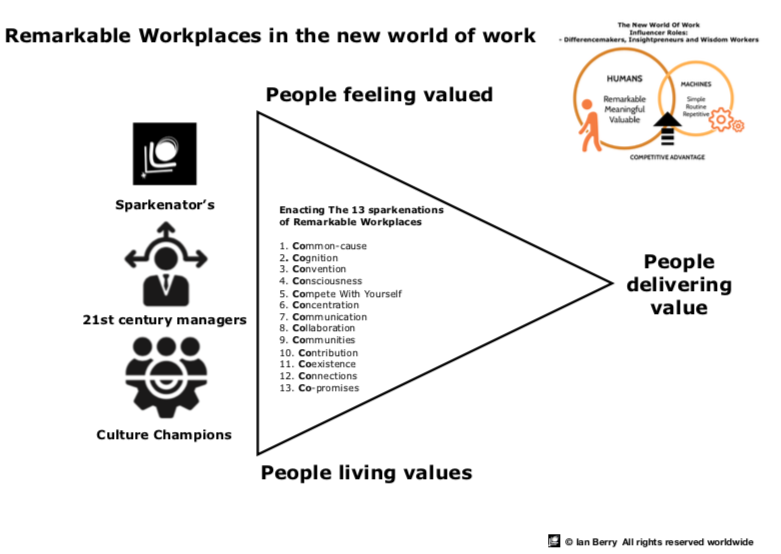 Most organisations have stated values. Very few are lived. 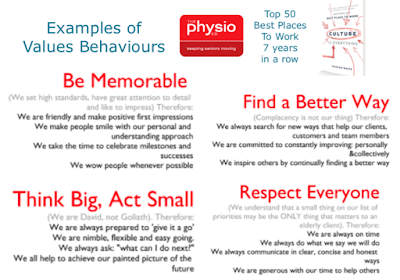 Rarely is there a shared- view around the behaviours that demonstrate values. Of course if you are the exception rather than the rule you have competitive advantage. You need a common-cause for your workplace, a purpose beyond profit. Profit is a result of being good at business, never a reason for being in business. Make sure your cause embraces people feeling valued, living values and delivering value and you will not only achieve better business results at less human and business cost, you will also be future-proofing your workplace.